The representative of the only international organization on an observer mission during the Sunday municipal ballot in Yerevan says that with the exception of individual incidents in a few polling stations, the elections were carried out in a calm and orderly manner and that the vote was technically well prepared. 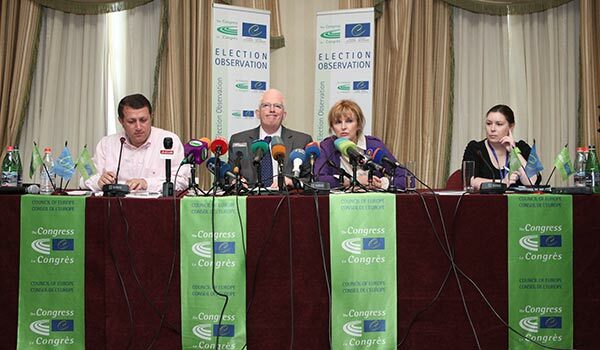 Head of delegation/Rapporteur Stewart Dickson, member of Northern Ireland Legislative Assembly, during his Monday meeting with the press presented the preliminary results of the monitoring of the May 5 ballot on behalf of the 12-member Congress of Local and Regional Authorities Election Observation Mission. The Congress observers were assigned to more than a hundred polling places in 13 election districts and monitored the voting process from the moment the polls opened and until they closed, including vote counting. “The secrecy of ballot was respected in great part. There was an impression that the ink for stamping the passports after voting has been improved since the previous elections, as well as there is an impression that the polls were better supervised,” Dickson said, stressing that the composition of precinct election commissions – as stipulated by the Electoral Code, each party and alliance represented in Parliament had one representative and there were two representatives of the Constituency Election Commission – ensured better opportunities for the contesters to scrutinize each other. Dickson also mentioned cameras present in each polling station, the majority of which were installed by the Prosperous Armenia Party and extensive filming, which can contribute to the transparency of the voting process, but can also create the impression of overly controlled processes and an atmosphere of distrust among voters. He also pointed out the use of cell phones especially during the ballot counting as another obstacle and said measures must be taken to limit that practice. There were a large number of domestic observers at the polls, he said, whose NGO or media backgrounds remained ambiguous to the members of the Congress delegation. Dickson says the impression was that many among the observers were acting in favor of political parties and/or alliances. He reported that days before the municipal ballot they had met with the diplomatic corps, NGOs and mass media representatives, as well as mayoral candidates and government officials to discuss the election-related concerns. The Congress of Local and Regional Authorities is a political council consisting of 600 local and regional representatives of 47 member-countries, and the key goal of it is assessment of the local level of democratic processes.